If you were lucky enough to get some extra cash or checks in your stocking, this might just be the perfect time to plan an impulsive vacation. 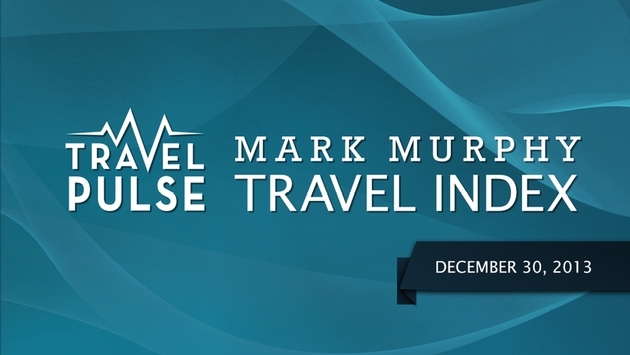 That's the big takeaway from this week of the Murphy Travel Index. 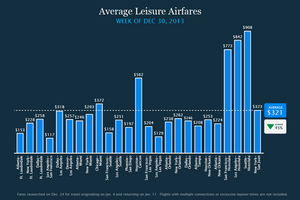 Leisure airfares dropped dramatically this week, as the airfares are encouraging travel during the New Year's week. That means less seats for business travelers, but thankfully, their fares are down as well this week. 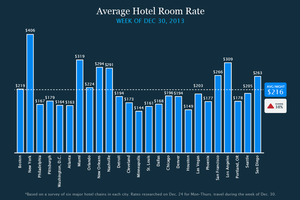 Hotel prices are up this week in anticipation of a lot of New Year's Eve reveling. And despite one tropical paradise with less than happy news for travelers, car rental prices are down as well. To be clear: Our numbers are based on research done last week looking for fares and rates for the Dec. 30-Jan. 2 week, except for leisure airfare, which was researched for the week of Jan. 4-11. - Ticket prices are down dramatically this week, which is great news for those who waited until after the holidays to take a vacation. - While flights to ski areas remain expensive – fares between Denver and Los Angeles are up 16 percent from last week – flights between the West Coast and Hawaii have dropped by half. 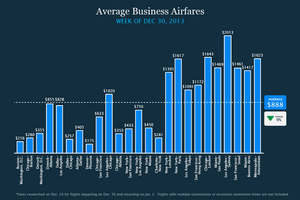 - Fares between the East Coast and Midwest to cities in Florida are 50 to 80 percent cheaper than they were last week. - Visitors to Boston can expect some hairy traffic for the next few months. The city’s Callahan Tunnel, which connects Logan Airport to downtown Boston will be closed for construction through March 12. Officials plan to institute new traffic patterns on Jan.6, Travelers who don’t want to deal with the hassle or the congestion may decide to fly in or out of neighboring airports in Providence, R.I., Portand, Me. or Manchester, N.H.
- Business fliers will find themselves competing for space on the plane this week with New Year’s revelers. - Prices are down from Christmas week, but the drop is not nearly as dramatic for weekday fliers as it is for their leisure counterparts. - Fares are up sharply on flights between Los Angeles and Chicago (up 128 percent from last week) and Dallas (up 78 percent), and ticket prices are also expensive on flights from Detroit to Atlanta (up 69 percent) and Washington, D.C. (up 42 percent). - Next week marks the end of an era: Delta is retiring the last of its DC-9s from service. The final two flights between Minneapolis and Atlanta are scheduled for Jan. 6, and are tagged as DL1965 (in honor of the DC-9’s debut) and DL 2014. 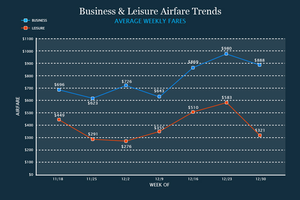 - Leisure fares are down a whopping $262 on average since last week and $134 on average this week. That reverses a four-week rise trend and brings the average price this week ($321) back below the average when we began tracking ($449). - Business fares are down after a three-week rising trend, down $92 on average since last week. Prices are still $198 higher on average this week versus the first week we began tracking. - Room rates are on the rise as the ball drops: many downtown and vacation area properties have raised prices to accommodate those who are planning to celebrate the new year away from home. - Average prices are up in cities traditionally associated with New Year’s Eve celebrations; prices top $400 for a room in New York City, while prices are up sharply in celebration cities such as Nashville (up 80 percent), Los Angeles (up 45 percent) and Las Vegas (up 83 percent). - Those looking to combine their New Year’s Eve with some fun in the sun can also expect to pay more for the privilege, with average rates up 44 percent in Miami, 59 percent in San Diego and 29 percent in Orlando. 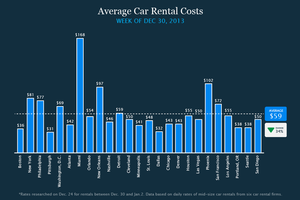 - Overall prices for car rentals have returned to pre-holiday levels in most every city, but travelers to Miami should expect to pay close to $200 per day (including fees and taxes) for a rental this week. - Rates are also higher this week New Orleans (up 31 percent) and Houston (up 3 percent). - Hotel prices are up for the first time in four weeks, up $61 on average this week. Prices are still down $26 on average since we began tracking the week of Nov. 18. 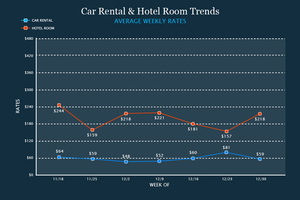 - Car rentals dropped dramatically after four straight weeks of rising prices. Prices dropped $22 on average across our survey this week and are down $5 since we started tracking.